CEVA Logistics, a leading global asset-light supply chain management company, designs and implements industry leading solutions for large and medium-size national and multinational companies. Approximately 56,000 employees in more than 160 countries are dedicated to delivering effective and robust supply-chain solutions across a variety of sectors where CEVA applies its operational expertise to provide best-in-class services across its integrated network. CEVA Logistics are contracted by British Gypsum to manage the load securing and end user distribution of their products throughout a large part of the UK from their production plants at East Leake, Kirkby Thore and Sherburn in Elmet. Julian Money, General Manager and the CEVA team based at the three sites have been FORS Gold accredited for three years and embraced the focus on operational safety and efficiency that FORS accreditation brings with it. Utilising the benefits of FORS accreditation has assisted building a strong understanding for all employees in the risks associated in operating LGV’s in both rural and city environments. FORS learning in both VRU’s and practitioner courses are a continuing mechanism that supports this culture. Initially we received a request to achieve the FORS accreditation from British Gypsum as some of the customers had stated the accreditation as a requirement for vehicles delivering to their sites. The site at East Leake was the second CEVA site to achieve FORS Bronze accreditation which contributed to us achieving multi-site accreditation. Passing the initial FORS Bronze audit was seen as a major milestone for the team and confirmed the foundation of a strong base to work with FORS and encourage a culture that had safety, efficiency and the environment at the forefront of anything we aimed to achieve. Working with CEVA’s central team and the team at FORS has ensured the processes across the three sites were aligned and up to the required FORS standard. We made the most of the benefits on offer in particular SUD courses, e-learning and practitioner workshops to drive the knowledge within our team. FORS workshops and the FORS conference has been a major input into our procurement of a safe and practical fleet this year, which has had VRU, environmental and driver support at the forefront of our project. As part of our commitment to be the “best in class” we have spent the last 12 months engaging with FORS, manufacturers and our cross contract working group which comprises of drivers, safety managers and cyclists to give us the basis of what we believed to be a vehicle that can deliver our desire of reducing risk to vulnerable road users. The specification has delivered a low riding vehicle allowing an improved standard of direct vision which enables our drivers to maximise their vision, rather than relying on technology, although with the input from our CCWG, we have also included a camera system which eliminates all blind spots and alerts the driver of anyone intruding into the “danger area” coupled with proximity sensors to the front and side. This reinforces our desire to provide our drivers with the tools to operate in the safest way and reduce risk. The roll out of the new fleet has seen 85 vehicles based at three separate locations, enabling us to deliver our clients products across the UK reducing the risks to VRU’s and to our employees. SUD has continued to be rolled out during 2018 providing our drivers with a good understanding of what cyclists encounter on a daily basis. It was soon established that drivers returned not only wiser, and better informed, they had also enjoyed it! Alongside the SUD courses, CEVA in conjunction with British Gypsum have also been visiting local schools to promote road safety awareness and demonstrate the challenges LGV drivers encounter. In 2018, we took park in local “Party in the Park” events and held a demonstration during the Tour of Britain cycle race in conjunction with the local Traffic Police, demonstrating the areas of risks around LGV’s. Taking a vehicle and trailer gives a reality to the general public and a real time understanding of the visibility an LGV driver has available. We achieved our target to increase FORS practitioners during Q1 and Q2 in 2018 to enhance our ability to support each site and the drive to FORS Silver of Sub Contractors supporting the British Gypsum contract. Next target Gold! 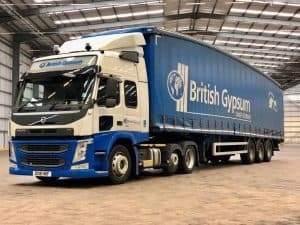 Once all three of our British Gypsum sites had achieved bronze, the teams were determined to step up to silver and a program of vehicle improvements and enhanced driver training was put in place using FORS accredited training and suppliers. With FORS Silver achieved in 2014 and successfully re-applied for in 2015, FORS Gold became our next goal to reinforce CEVA and British Gypsum’s determination to demonstrate freight operator excellence at the highest level. This was achieved in Q4 2015 and has been sustained for the last three years with continuous improvement and training utilising FORS tools and workshops. Improvements in MPG have again been gained during 2017 with the use of economic driver training. This aligned with the managing of telematics results has also resulted in an improvement of results from category C in 2015 to category B in 2016 and 2017. The focus on driver behaviour through FORS workshops and telematics had seen a reduction in incidents per 100,000 and blameworthy RTI’s however, improved reporting and an increase in the use of FORS tools to further enhance our trend analysis on data captured has shown an increase in recorded incidents and blameworthy accidents. New vehicle specification is standardised to include FORS packs with further development on additional safety systems through FORS accredited suppliers. *Annual improvement in MPG although increase in Incidents per 100,000 Kms which has been driven by improved reporting and data collection. Driver health and fitness review – CEVA engage with a third party provider for initial pre-employment screening and all employees are responsible to ensure the company is advised of any changes to health or medication. Every five years a medical, similar to the pre-employment screening, is undertaken by the third party to minimise the risk of incidents as a result of underlying health problems. 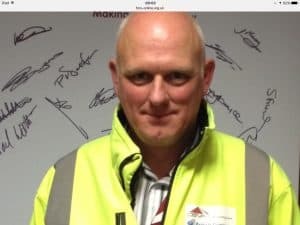 Strategy for recruiting drivers – CEVA have a program of Warehouse to Wheels as well as apprenticeships to continually drive recruitment, this has been successful in 2017 and continues through 2018, and has helped to increase driver pool. Noise assessment – Noise pollution is controlled by restricting operating hours at sites in conjunction with local neighbourhoods. Future improvements on road conditions on and off site have been planned. Delivery point risk assessments are completed which look at alternative routing that minimises local disturbance. Modal shift and alternative vehicles – Transport strategy at CEVA is reviewing alternate modes of transport along with availability of varying methods of powering vehicles and plant in future procurements for British Gypsum. 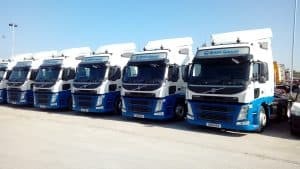 In order to make continual fleet improvements we have procured Euro VI vehicles taking into account DVS and low entry cabs to enhance the drivers direct vision. With the amount of improved FORS toolkits available, reviews were completed utilising those tools giving further improvement to analysis. Available alternative fuels will be the focus going forward and there capabilities to carry high payloads and efficiency as well as the available network to “refuel”. Monitoring driver fitness and welfare will continue to be high on the agenda along with retention and recruitment. Being a FORS Gold operator has enabled us to offer guidance and share our experience and journey with suppliers of sub contract support and has proved successful as our pool of subcontractors have progressed from Bronze to Silver with that journey ongoing to target Gold. Our goal is to continue improving using FORS Gold as a benchmark.